If you have ever wished your smile was brighter, whiter, your teeth looked different, or your worn or damaged smile were renewed, you may benefit from dental veneers. Due to their versatility, veneers can address any number of cosmetic dental issues. Find out more about dental veneers and how they can help your teeth with Dr. Adam Pasono at Green Bay Family Dentistry in Green Bay, WI. Dental veneers are super-thin shells of porcelain which fit over the front of the teeth to change their appearance. Veneers are versatile restorations, allowing you to subtly repair a single tooth or completely overhaul your smile by placing veneers on every visible tooth. Your dentist is your best source of information on veneers and can help you choose the best treatment path for you during a consultation. Dental veneers are made to fit over healthy natural teeth. Before placing a veneer, your dentist must ensure that the tooth in questions is free from plaque, teeth decay, and gum disease. A strong at-home oral care routine will help keep your veneers and underlying teeth healthy. A good candidate for veneers also has cosmetic issues like stains, chips, cracks, misshapen teeth, or slight over or under crowding. What can I expect from the process for dental veneers? A dental laboratory creates each dental veneer custom for you and your smile. For this reason, dental veneers normally require several appointments to complete. At your first appointment, your dentist will prepare your teeth to receive the veneer then take an impression of your mouth. The dental laboratory uses the impression to design and create your veneer, then sends it back to your dentist. In the meantime, you will wear temporary veneers to protect your teeth. At your second appointment, about two weeks after the first, your dentist will remove the temporary veneer and replace it with the final restoration. For more information on dental veneers, please contact Dr. Pasono at Green Bay Family Dentistry in Green Bay, WI. Call (920) 432-8492 to schedule your appointment with your dentist today! Are you interested in dental veneers but aren't sure you're a good candidate? Dr. Adam Pasono, your Green Bay, WI, dentist, explains who can benefit from this innovative cosmetic dentistry treatment. Your Oral Health: Good oral health is a must before undergoing any cosmetic dentistry treatment. If any problems are detected, you'll need to treat them before your receive veneers. Your Oral Hygiene Habits: Good oral hygiene habits will keep your veneers in excellent shape for years to come. In addition to regular flossing and brushing, you'll want to avoid doing things that can damage veneers, such as opening packages with your teeth, chewing on ice cubes or biting your fingernails. When you shop for dental care supplies at a Green Bay store, look for non-abrasive toothpaste and a toothbrush with soft bristles. These products will prevent scratches and help keep your veneers looking good. Your Grinding Habit: Grinding or clenching your teeth at night can damage your veneers and erode your tooth enamel. Luckily, you can still receive veneers in most cases as long as you wear a nightguard while you sleep. Your Dental Imperfections: Veneers can transform teeth affected by discolorations, chips, cracks and slight gaps. They're also a good choice if one or more of your teeth are slightly crooked. 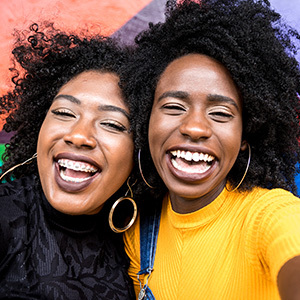 If your teeth are very crooked or your bite isn't aligned properly, orthodontic treatment will be a better option. If you receive veneers without correcting your bite, uneven pressure on your teeth can eventually cause the veneers to crack or break. Veneers can completely transform your smile! Not sure if you're a good candidate? Schedule an appointment with your Green Bay, WI, dentist, Dr. Pasono, by calling (920) 432-8492. Are you ready to find out if dental veneers could give you your dream smile? It doesn’t seem fair when someone flashes their beautiful teeth and says that they never had to get braces or any cosmetic dentistry. Of course, not everyone can be so fortunate, but that doesn’t mean you still can’t have a smile just like that one. And trust our Green Bay, WI family dentists, Dr. Adam Pasono and Dr. Paul Vander Kelen, when they say no one will be able to tell that you have dental veneers. Unlike dental crowns, veneers are tooth-shaped shells that look like false nails and are bonded to only the front surface of your teeth. Since they don’t cover the whole tooth they don’t require the same tooth preparation that a dental crown would. If you know about dental crowns then you may know that in order to get one we need to file down a significant amount of enamel from your teeth so that the crown fits over it. A local anesthesia is required to do this. But with dental veneers you don’t have to worry about anesthesia or extensive filing. In fact, we only need to remove a very minimal amount, and in the cases where people choose to get no-prep veneers, no tooth enamel needs to be removed at all. How great is that? So, who can benefit from dental veneers? It’s amazing how this one restoration could transform your smile so that you no longer have to deal with crooked front teeth or unsightly gaps between your teeth. Veneers can instantly straighten, brighter and reshape your smile the way you want it. If you are ready to get a smile makeover in Green Bay, WI that will dazzle and make you feel confident again, it’s time you talked to our dentists at Green Bay Family Dentistry.